The Hundred Year’s War is not really an accurate name for the medieval war between England and France. The war actually lasted one hundred sixteen years, from 1337-1453, and was not a continuous war but a series of conflicts, with off and on fighting depending on the belligerence of kings and the course of the plague. The war began when the last son of Philip IV of France died without issue. As the mother of the English King Edward III was Phillip’s daughter, Edward claimed the French throne, as well as his own. The French refused his claim, citing the Salic Law which prohibited royal inheritance by a female descendant of the king and gave the crown to a nephew of Philip IV, Philip VI. Naturally there was war. After the death of Edward III in 1377, the fighting died down somewhat as both realms were more concerned with internal matters. Henry V renewed the fighting in 1415, taking advantage of political unrest between branches of the French royal family, particularly the feud between the Armagnac or Orleans faction and the Burgundians. After his decisive victory at Agincourt, Henry V was able to compel the French King Charles VI to disinherit his own son, the Dauphin, later known as Charles VII, and declare Henry his heir. Henry V died in 1522 leaving an infant son Henry VI who became king of France upon the death of Charles VI later that year. Thus France had an English king from 1420 to 1450, at least in theory. 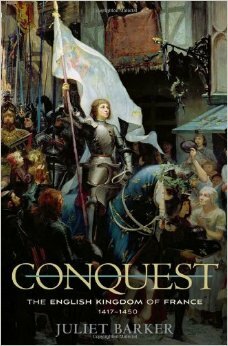 This English kingdom of France is the subject of Juliet Barker‘s Conquest: The English Kingdom of France, which covers the last part of the Hundred Year’s War. It is a fascinating story of a France almost completely defeated rising again to expel the invader, of a disinherited prince with no hope of gaining his throne turning the tide with the help of Joan of Arc, and of an infant king with a faction ridden council of regents and a land worn out by fighting, growing up into a weak king willing to make peace at any price. It is a story of battles and sieges, of brave knights and treacherous mercenaries and family squabbles that affect the course of nations. Juliet Barker makes this story come alive with the skill of a novelist. She brings out the personalities of the principals involved in the war and politics of the two kingdoms and describes the events in a way that excites the interest of the reader. By the time I was halfway through the book, I found the narrative so fascinating that I had trouble putting it down. If you like the Game of Thrones, you’ll surely love this history of a real life game of thrones. The only complaint I have is that the maps really weren’t enough. It might have been nice to include one or two maps showing the course of the various campaigns. Other than that, this was an excellent history of a long ago war.